With the leg backs and A-frame arms extended it's very stable. silicone rubbers on both legs and on top to protect your guitar from damage and scratches and provides a good grip so that it does not slide. In addition, It's well made with aluminum and silicone rubber, the highest quality making it excellent and durable. -It is easily to set up & carry away ,ideal for home, studio ,travel. -It is sturdy and strong but light weight, suitable for guitar, bass, banjo. -The supporting arms and legs can use to adjust to the required size of your instrument. -The locks at each end of the arms guarantee more safe and stable when place your instrument in it. MULTIPLE USE - It can safely hold many kinds of instruments such as Acoustic/Electric/Classical Guitar,Bass,Banjo etc . 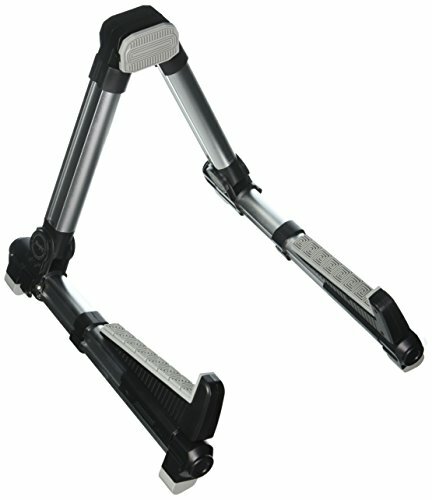 Two supporting arms & bars are movable to fit the actual size of your instruments . STABLE & PRACTICAL - Integrated design of 4 big size 3.5 *2.5 cm aircraft-grade aluminum alloy tubes with no movable nodes applied to provide the max stability for your valuable instruments. The open-close clock patented design in each end of the supporting arms improves the stability of the whole structure with instruments placed in the stand. FRIENDLY DESIGN - The thick backrest silicone rubber pad is shiftable according to the actual size of your instrument, so your instrument body won't get damaged in contact with it. Movable bars with Chinese traditional pattern soft silicone pad not only protect your instrument ,but also gives it a beautiful look. PORTABLE AND EASY TO CARRY - It's easy to set up and can be folded into a small size of 12.2"*4.7"*2.8"(31*12*7cm). Only 496g net weight is very light, it's easy to carry away for practice. ROBUST CONSTRUCTION - Made of aluminum alloy + ABS + quality silicone rubber.Good stability A-Frame design with attractive appearance,and it also has anti-rust function.